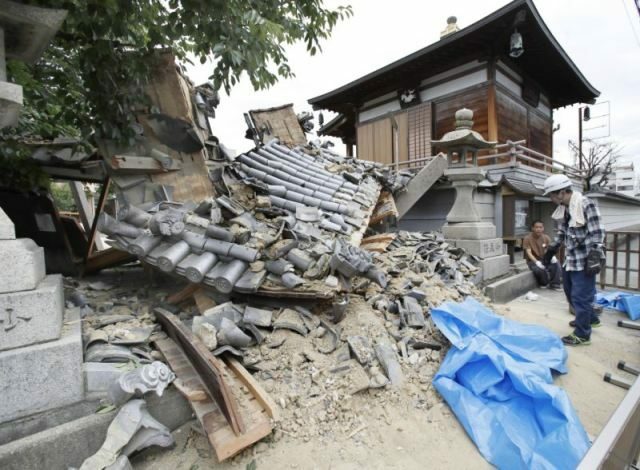 The death toll in a powerful earthquake that rocked Japan’s Osaka on Monday has risen to four, with over 380 injured, officials said Tuesday, urging vigilance against landslides ahead of heavy rains. The fourth fatality was an 81-year-old woman, who died after she was trapped under a chest of drawers in her house, officials said. The other fatalities included a nine-year-old girl who died in the city of Takatsuki north of Osaka, trapped by a collapsed wall at her school following the 5.3-magnitude quake. The other two were an 80-year-old man — killed by a collapsing wall — and a 84-year-old man trapped under a bookcase in his home, officials said. “So far we have confirmed that four people died and 381 people were injured,” top government spokesman Yoshihide Suga told reporters on Tuesday. It was not clear how seriously hurt the injured were. “The government will keep up efforts to rescue people,” he said, though he added that there were no reports of missing people. And he said officials would do “everything we can” to quickly restore gas and running water to homes cut off after the quake. Japan’s meteorological agency meanwhile warned that heavy rains expected in Osaka on Tuesday and Wednesday could cause landslides in the region, with the quake potentially having loosened earth. The weather agency said the region could see 50 millimetres of rain by Wednesday morning and up to 100 millimetres in the 24 hours after that to Thursday morning. “Normally we don’t issue warnings with this level of rains, but after the quake it could cause landslides, floods and swelling river streams,” official Masakatsu Oya told AFP. Officials have also warned of the possibility of strong aftershocks in the coming week and especially in the next two to three days. Electricity outages caused by the quake have been resolved, but restoring gas and water will take longer, officials said. The education ministry also told AFP on Tuesday that it would instruct education boards nationwide to inspect school buildings, after the death of the nine-year-old girl at her school. More than 500 primary and secondary schools in Osaka and four other prefectures suffered damage to their buildings including collapsed ceilings and broken window glass, the ministry official said.